When you first get your green iguana, he may be quite tame and friendly. He could also be unfriendly and unwilling to let you touch him. This is understandable since iguanas are wild animals and you are unknown and a possible predator. With time, patience, and persistence your wild pet can become a fun and enjoyable companion. You should not immediately try to pick up, pet, or hold your new pet as soon as you get him home. Allow him a period of adjustment. Being moved to a brand new home is a traumatic event for an iguana. Give him a week or two to adjust to his new surroundings and your presence. Try to do everything possible to keep your iguana calm while attempting to tame him. This is primarily accomplished by not doing things that could scare him. Avoid making loud noise, making sudden movements, and always trying to pick him up when you are near. You should also remain calm and in control when around your iguana. If you are jittery, scared, or nervous, he can sense that and it could freak him out. Hand feeding your iguana is a good way for him to get accustomed and feel safe around you. Attempt to hand feed your pet his favorite foods while he is in his cage. Even if he won’t eat it, he will be slowly getting used to you being around. It may take a while to get your pet to accept food from you, or even see it eat, but it is a great way to build trust. Every time you go into your pet’s cage you should not immediately try to pick him up. Sometimes just put your hand in the cage or attempt to pet him. Always pet a reptile the same direction as his scales otherwise it may be an unpleasant experience for him and you. Petting and hand feeding will help your iguana feel comfortable while still in the safety of his cage. When you pick up your iguana, always gently lift and support him from under the belly. 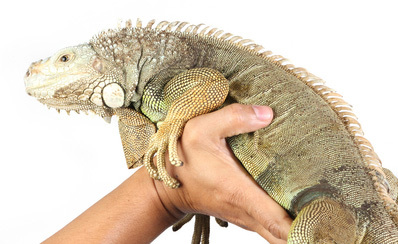 Grabbing an iguana from above can be perceived as a predatory action and scare your pet. Make sure you give him time to release his claws from wherever he is perched. You do not want an accidental injury from a claw being ripped. When you bring your pet out of his cage, restrict him to a small room at first. Most rooms will seem huge compared to his normal habitat. The room should also be iguana proofed so there are no places where he can get hurt or trapped. They are climbers, so be sure to check high and low for dangers. You can start by sitting in the room and just pet or hold your iguana. He may stay or wander off to explore. If he decides to explore, just keep an eye on him. Iguanas love to check out and inspect all parts of a room. Try to handle your pet daily, even if it’s only for a few minutes. Persistence and repetition are key in trying to tame an unruly iguana. All it takes is regular handling, hand feeding, petting, some freedom, and time. Your wild tail whipping pet can eventually be friendly and enjoy your company and attention.